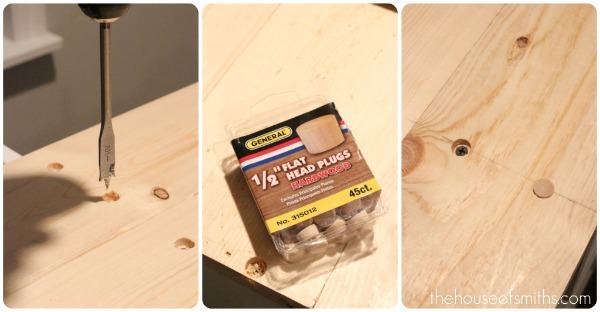 Since I am planning on having my Faux Barn Wood Tutorial posted on either Monday or Tuesday of this next week, I thought it would be good to cover the actual construction of my new worktable for our Blogger's Office Makeover, beforehand! If you remember from our earlier post, we bought these great ALEX Ikea drawer sets first, assembled them and set them on a platform. After that, we cut some high quality plywood for the top and sides to make the unit appear that it was one cohesive piece. 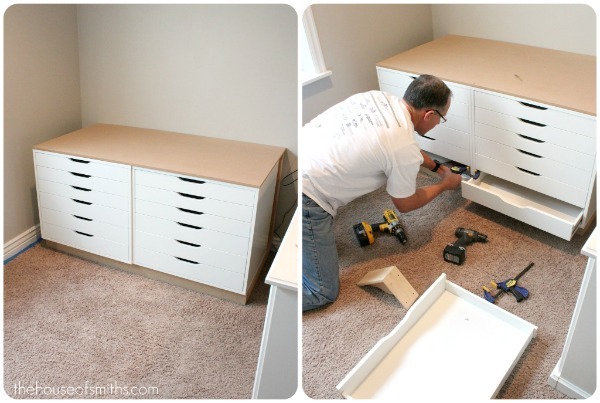 We held the two drawer units with clamps to help them stay straight and then secured everything to the 2x4 platform with drywall screws. Next we added a couple of dividers to the table, so that I could have extra storage for baskets. 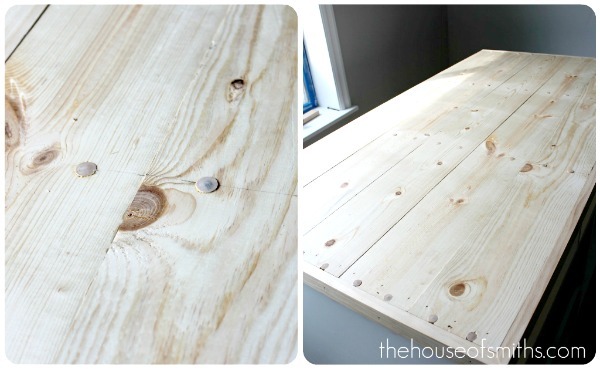 After the "shell" of the table was finished, I filled all the screw holes with putty, and sanded my little heart out. Once everything was sanded smooth I got to painting! Let me tell ya that plywood literally SOAKS up paint like you wouldn't believe, so I did 2 coats of primer and 2 coats of semi-gloss white, to make sure that I had really good coverage. Next we had to assemble the actual work TOP of the table. For this we chose a bunch of 1x6 inch pine boards. You can get them at ANY hardware store for only about $3-$4 a piece. My Dad's "super tools" came in handy with this next portion of the project, because we had to glue the boards together and them clamp them tight while we screwed them down. Since I was going for a Faux Barn Wood type look for this tabletop, I knew I needed to add a little extra character to the wood, but couldn't think of anything really special, besides just distressing it. But thanks to my Dad, and his creative geniuses, during a quick stop to the hardware store for screws he spotted these flat head wooden plugs. We decided that we would drill a few lines of holes in the wood to make it look even more rustic! We added a drop of wood glue in each little hole before we placed the plugs in, and then trimmed out the edges of the tabletop with some additional wood, to finish off the whole thing. So as you can see above, some of the pegs were sticking up a bit high, so that's when my Mom and I got to work :) I talked about this more in my last post about the table, but basically, to get the tabletop ready for paint, we had to sand, sand, sand... or and did I mention, sand!? Even though I was going to be beating up the table a bit, and making it LOOK old, I still wanted a really smooth surface to be able to work on. 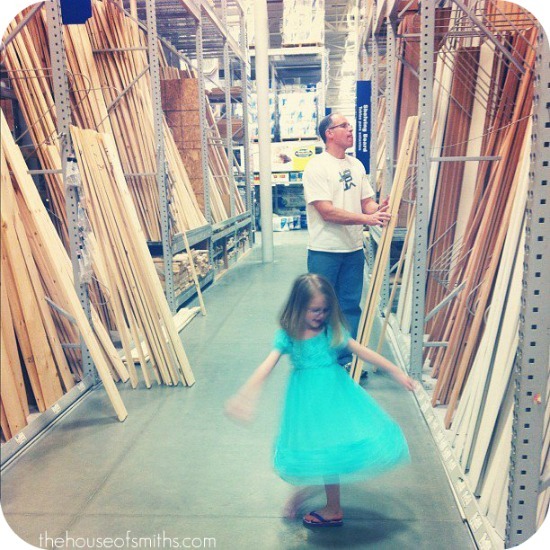 I didn't want papers, fabric or other things catching on pegs or uneven wood. Like I mentioned earlier, this next week I'll be sharing my Faux Barn Wood Painting Tutorial (that I did on the top of the worktable) and also start telling you a little more about what we'll be doing ABOVE the worktable, on that big blank wall! You know my post that I did a while back about keeping a few "secrets" from you guys, and how I felt kinda bad about it, but told you I would disclose them as soon as I was allowed? Well, if you're home tonight around 7pm (or 5pm my time) you may or may not catch us on a little channel called HGTV, with my cute, new friend Sabrina Soto! We were asked to be part of one of her specials called... are you ready for it... CLEAN FREAKS. haha! Yup, that's what having a REALLY organized pantry will get ya. I'll be talking more about this next week, but I just wanted to give you a heads up, because we just found out today that it was airing. Great stuff! Love the table top. 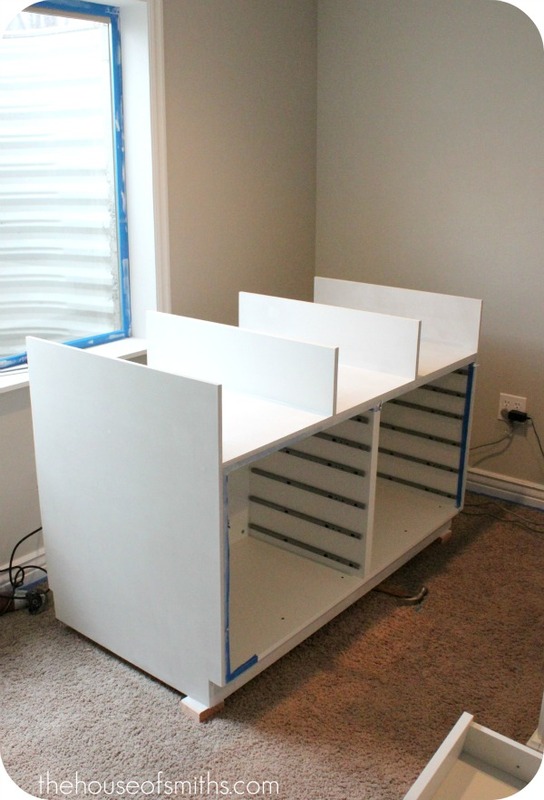 Your custom shelfs are going to add so much more to it as well. WOW!! We are working on an Ikea install RIGHT NOW!! It wont be awesome as yours, but I hope it comes close! i'd really LOVE to know the name of your gray wall paint color in your "new" office. It's lovely, I'm having SO much trouble with finding the "right" gray that I'm about to cry. Please help. 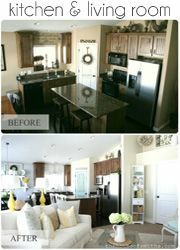 LOVE the office makeover and am SO excited for your HGTV debut ;) such exciting news! congrats Shelley! My dvr is set! Yay!! 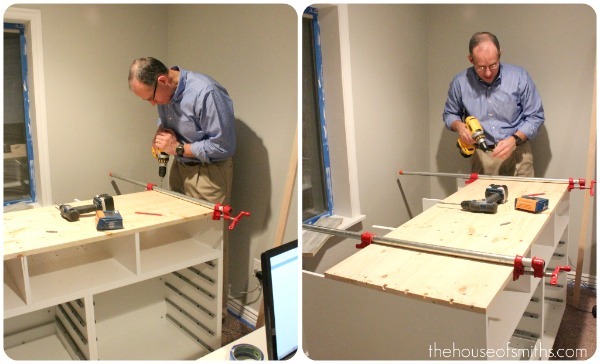 Your office is coming together and I love your worktable, Shelley! How awesome to be on HGTV. 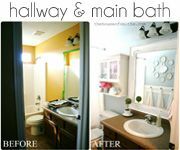 While I doubt you feel your house is clean for very long, you have a very clean and bright color scheme to your home. Enjoy your moment in the spotlight. You've earned it. Shut UP! Here I am, watching the High Low Project with Sabrina right now, and you go and sneak that little nugget in at the end of this post! Soooooo cool! I'm so watching that tonight. Good for you! What the awesome!?! Sabrina is awesome too!! And so is your pantry! That's so cool!!! Congrats!!! Oh I so want me one of those worktables! :-) You should send it to the IkeaHacker website because it's got to be the best hack I've seen. LOVE the office table and am soooo thrilled for you guys to be on HGTV!!! Setting the recorder now! That looks amazing! AND OHMYWORD! That is SO rocktastic you are going to be on HGTV!! WOO HOO! LOVE it! HGTV!? How awesome! I'm watching it now-- can't wait to see your segment! Watching you right now!! How exciting!!! Congrats! I love your home and Sabrina. What an opportunity! OMG, Shelley...you're on my TV right now! I just missed this post and said to my husband....I read her blog every day!!!! Great segment!!!!!! This is so funny. I was just reading your post when I saw that you were going to be on TV. I changed the channel just as your segement was starting. I got to see you while reading your post. LOVED it! I'm watching the show right now. Love your house! Too, too funny! I was just sitting here watching Clean Freaks when my husband and daughter walked in from dinner out together and I said "Shelley"! I was so excited to see you! Great segment, and my daughter thinks your girls are adorable (I do too!)! I just saw you on HGTV like 2 minutes ago keep up the good work !!! I've been reading your blog for a while now and as soon as I saw they were in Salt Lake City, I knew they were featuring you! I called my hubby in from his video games to tell him, "I read her blog! It's the Smiths!!" LOL I don't know how impressed he was but I very much am! It's so neat to see people you psuedo-know on TV! Such cute ideas they featured too! Oh my goodness! I was watching a little HGTV show Clean Freaks with my daughter-in-law and I saw a little snippet.. I was like... I know her! I follow her blog! Of course, as you know, I don't actually know you, but I have been following your blog since you made over your pantry and everyone was blogging about it. Just wanted to stop in and say how excited I was to see your home on HGTV! Congratulations! 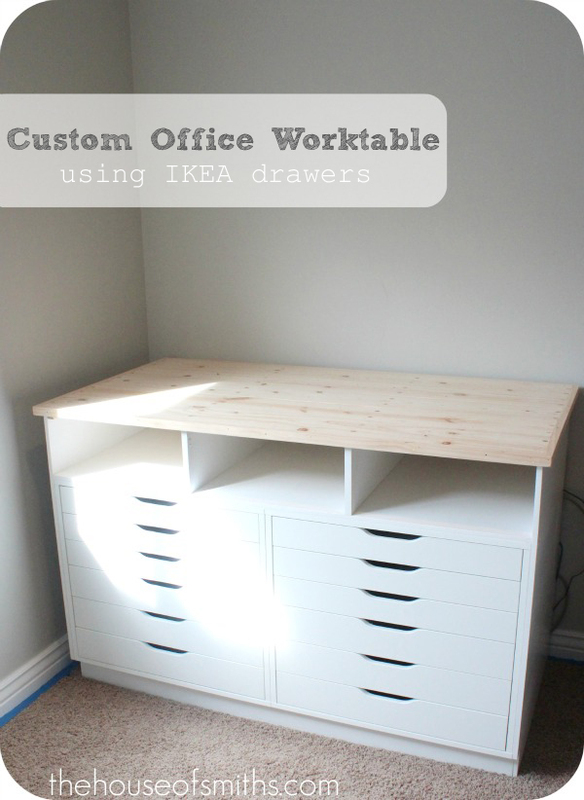 By the way, I do love your DIY projects... really loving the Office worktable project! Wow--I happened to catch the HGTV show by chance...didn't know you would be on. It was funny to hear your voice after reading your posts for so long! Your segment was fabulous, Shelley. Congratulations! Plus--I'm super jealous that you met Sabrina. She is the cutest thing ever and my favorite on HGTV. Just saw you on tv! I was like omg I know that girl. I read her blog!!! Love your house you are so talented!!! What an awesome build! I can't wait to see what you're doing next! HGTV should be honored to have YOU! OK...I just finished watching clean freaks on HGTV...I love Sabrina Soto....I was happily surprised to see you!!!!! YEP.....there you were...you were fantastic! So I logged on to head here to tell you! by the way....I love this table project.....I am bigging to learn to quilt and need a great work space....I think this might be it! Congrats on your HGTV debut....you guys were amazing! *Loved* watching you on HGTV. I really enjoy your blog and enjoy watching your journey. Thanks for sharing!! 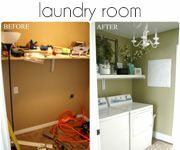 Saw you on Clean Freaks on HGTV......girl you were awesome! You rocked it. Congratulations that is quite a validation of your talent!!! OMGosh! I wish I knew you were going to be on HGTV sooner... I just missed it :( I hope they replay it! Just saw you on HGTV - so exciting! Congrats! Just got in from doing yard work & saw your post. So disappointed that I missed it!! Do you know if it will be airing again? I just watched you today at 4:00 my time and you were fantastic!! I was like, see her? See that hot blonde? Yep she and I are like this ~crosses fingers~ - LOL!!! I love your home and your tips! You carried yourself wonderfully on camera -- was it hard with the camera in your face? You made it look like second nature. LOVE this table, too, ammmazing! You looked great on clean freaks. 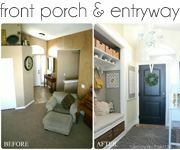 Great tips and your house is super cute. Looks great! That is such a good idea, it seems like a lot of people are taking simple Ikea furniture pieces and turning them into really awesome functional pieces for there home. there is a lady who took two small coffee tables with drawers and turned them into a hall tree with seats for her kids. And there are TONZ of things you can do with their apothecary shelves. Its just so cool. You were GREAT tonight!! I wish I had thought of using velcro to hang photos about 100 holes in the wall ago!! You sure did an amazing job on HGTV tonight...I mean you were really really good! I was so proud of you. It was fun to see your personality shine after following your blog for so long. Congrats from a faith reader from Wisconsin. Just finished watching Clean Freaks. You were awesome!! Love the work table. Wow! You guys are amazing! I want to borrow your dad.... but I am sure everyone else does too. I like his dress clothes when he is screwing stuff!! :) made me giggle. It looks amazing so far and I am sure the whole thing does too! I LOVED you on "Clean Freaks"! And now I found your blog so I'll definitely be sticking around! WOW that looks so awesome! Shelley- Just saw you on clean freaks!! I only wish it had been longer so I could have seen even more. It was fun to see the house on tv instead of just in pics. Love the new work table. I like how the top is planks but then framed in around the outside. I think you should have your own show on HGTV! I love this tabletop. I like how it is individual planks but then framed in around the edge. I'm really interested to see how you did the painting. Hey Shelley! I saw you on the show before even reading this post! I was so excited :D. I love Hgtv and especially Sabrina Soto. Your home is to die for! I loved everything about it. The girls were super cute. Congrats on everything! You are getting well deserved exposure. Keep up the great work. You are an inspiration to us all. BTW, You and your family were just as cute as I thought you would be on HGTV! What a great show too - lots of great ideas and inspiration to be had. And then there's me, telling my husband, "I know her! I follow her blog!". I felt like I had a celebrity spotting. ;-). Great job!! Saw you on the show last night...you ROCKED!!! 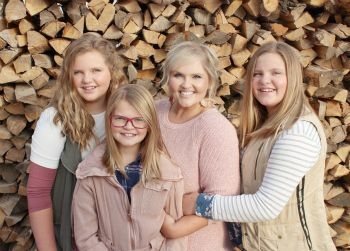 super cute family and a hope to die for! keep on keepin' on, girl! so so fabulous! i love the top and can't wait to learn more about the painting. i'll have to see if i can find a way to check out the show since i missed it. congrats--how fun for you. I just saw you on tv last night and then I totally randomly found your blog today! You did awesome on the episode and I loved your house and your creative ideas! so glad I found you! I saw you Saturday with Sabrina on HGTV, HOW COOL IS THAT! Congrats! I absolutely adore the way this project is turning out! 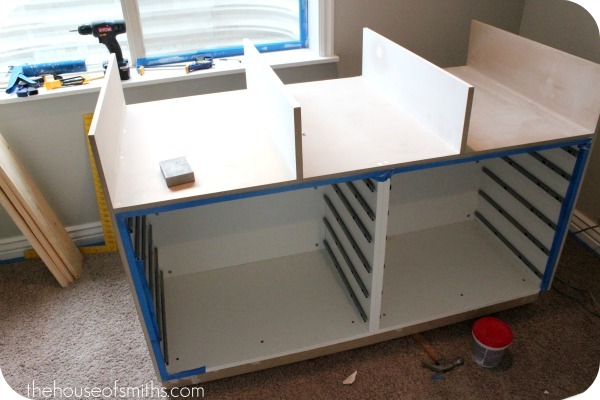 I want to use those Ikea cabinets as a base but use them to store all the kids art etc.! I am so so sad I missed the show!! I will for sure find it on rerun. So exciting for you!! It's been awhile since I've checked in on your blog and of course I absolutely love the desk. so sheek and neat. the perfect workspace for any crafter. Do you rent out your Dad? I'll pay good money & even feed him for his handy work! Lol! Do you rent out your Dad? I'll pay good money for his handy work----& even feed him while he's here! I absolutely love your blog, I follow you and I subscribed, I am so sad to have missed you on HGTV last night, but I am so happy for you. You totally deserve it, and your home is just fabulous! I hope to one day have a successful blog just like you do! thanks for all of your ideas. Love this! I would love to have this for a sewing table! I would alter your design slightly by adding a middle opening for my legs to fit in! Great inspiration! Thanks for all you do! Looks great,incredible blog! Very helpful post I must say Simple & interesting Wonderful work done by you And Such nice ideas they featured too!! Awesome project! I'm sure you were extremely pleased with the outcome. It's always nice to add ample storage while enhancing decor! 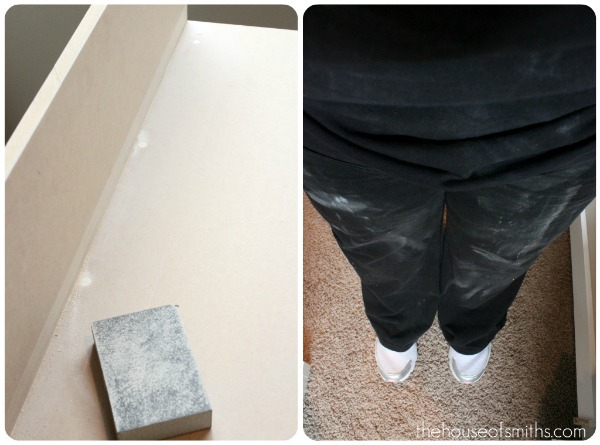 Putting in a little elbow grease goes a long way when it comes to furniture. I've never seen a 6 drawer alex on ikea's site. How can I find this? Thanks!!! That looks great I love the look of wood and keeping a few scratches gives some real character to the table/desk top. 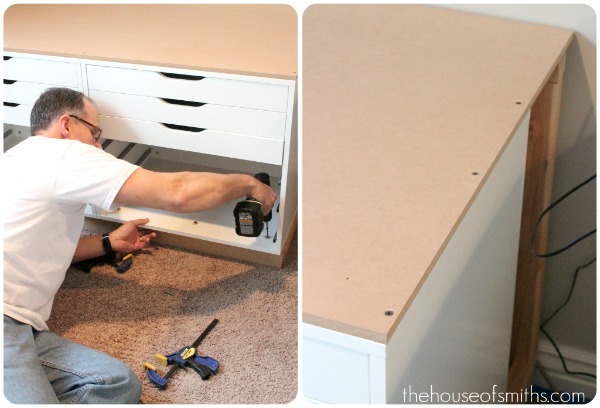 I really liked this article it gave me some ideas for my office desk that is in the works. Thanks. Nice make over for office design, it is really great tasks. Thanks for sharing the process of setting up your office, but I would love to see the final result - how the office room looks like at the end. The drawers are very useful. I also prefer drawers rather than shelves as shelves get very dusty.